Averill is seeking energetic, career-oriented professionals across the country to join our team! Averill is seeking energetic, career minded professionals to support our efforts in leading and directing sophisticated fundraising campaigns, planning studies and development audits, and interim staffing and professional training for our growing base of blue chip clients. Qualified candidates should email a cover letter and resume that includes your salary requirements and an explanation of how your professional skills and accomplishments prepare you for a successful career with Averill to careers@averillsolutions.com. Averill offers a competitive salary and comprehensive benefit package. Salary is commensurate with experience. *Resumes that are submitted without a cover letter will not be considered. Averill Fundraising Solutions is a different kind of philanthropic management firm: a firm with creative and tailored service models, flexible pricing, and unmatched experience and commitment. Through our unique, hands-on approach, we ensure that our clients’ fundraising efforts, from annual appeals to strategic planning to capital campaigns, consistently exceed expectations. 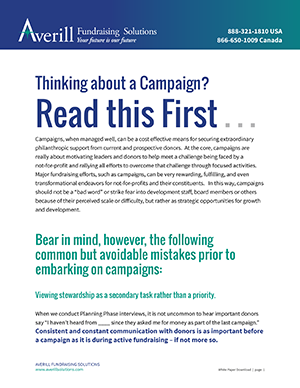 We provide our clients with a fundraising strategy that meets their unique circumstances; a strategy which will enable them to fund their mission, build capacity and sustain growth. Our team has combined over 65 years of experience serving secondary and higher education, hospitals and medical centers, academic medicine, faith-based organizations, global health organizations, human service organizations, professional and membership societies, arts and cultural organizations, and civic and social groups.